I have to admit I'm one of the lucky ones that doesn't need to use a deodorant all the time. 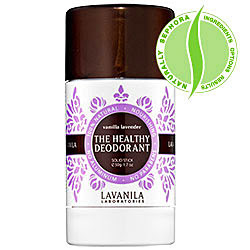 :) You all know I am all about using natural products when possible so when I received this All-natural, free of chemicals, healthy deodorant by LAVANILA Laboratories to try, I was pleasantly surprised that it worked just as well as others I have tried in the past. To truly test its effectiveness, I used it while doing a 30 minute (intense-hehe) workout. Results? Passed with flying colors. I first heard about LAVANILA Laboratories when I tried a sample of the Vanilla Grapefruit fragrance from Sephora. Vanilla smells clean and crisp and with the fruity grapefruit scent; the citrus flavor gave the overall scent a great kick. Its sweet scent is subtle enough for everyday wear and also strong enough to wear on a night out.